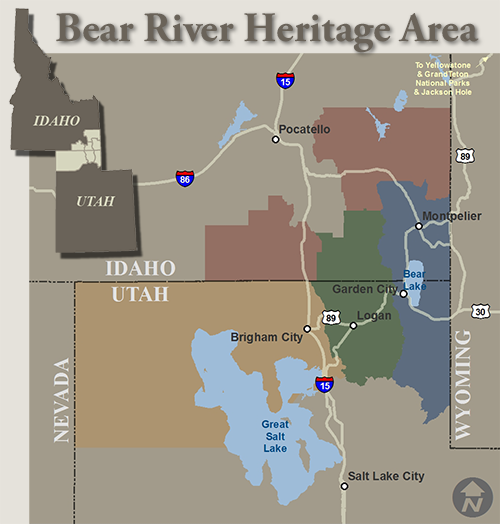 The Bear River Heritage Area straddles the Idaho-Utah border where the Great Basin and the Rocky Mountains meet. It is home to the Northwestern Band of the Shoshone Nation, a strong agricultural economy, history-laced landscape, Mormon history, the Oregon Trail and abundant natural beauty. This website is your guide to a fascinating variety of natural, historical and cultural experiences found within the Bear River Basin of Northern Utah and Southeastern Idaho. Let us share how this land and these people have enriched our lives. Scroll down to discover things to See and Do, Things to Know about, and links to Shopping and Lodging in the Heritage Area.